Recently, Jesse and I were gifted with a little brown bag full of beautiful chanterelle mushrooms from one of our dear friends. I adore chanterelles, so when she asked if we wanted some, there was no hesitation. 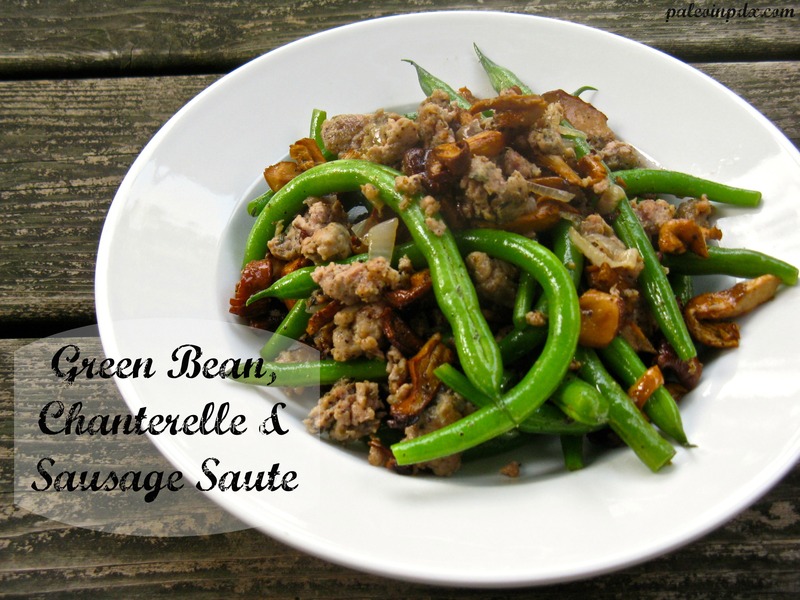 This green bean, chanterelle and sausage sauté is meant to be served as a side dish and would be a great addition to any Thanksgiving spread. Of course, if you really want to eat it as a main dish, you can do that too. Jesse actually ate it for breakfast with two sunny side-up eggs on top and it looked delicious. There’s no right or wrong here and it’s whatever suits your fancy, really. Melt 2 Tbsp of the butter in a large pan over medium heat. Add the chopped shallots and stir. After a minute, add the chopped chanterelle mushrooms. Saute 2-3 minutes or until mushrooms are soft. Pour into a bowl and set aside. In the same pan over medium heat, add the pork sausage and break up with a spatula. Continue to cook a few minutes. Once sausage is nearly cooked through, add the green beans and season to taste with sea salt and pepper. Toss the green beans with the sausage and then cover the pan with a lid to steam green beans for 3-4 minutes. Then, remove the lid and add the remaining 1 Tbsp of butter. Toss to coat the beans and then add the mushroom mixture back to the pan. Add the nutmeg and toss again. Add more sea salt and pepper if desired. Taste and adjust seasoning if needed. Looks fantastic! If we end up with more this year, which is very likely, I’ll keep you in mind for sure! Sounds great to me! Thanks again! I am looking forward to trying this recipe….it may be my new add in for Thanksgiving this year too!! This looks soooooo good and I can’t wait to try this out. I love all of the ingredients in this recipe. Thanks for this one!